Wither the Wireless Mighty Mouse? When the Mighty Mouse was announced, I was very skeptical about the Scroll Ball. I thought it would be too small and not responsive enough. Boy was I wrong. I love it, I think it has the best multi-directional feel of any mouse I have tried. After I had used it with the Intel iMac at work, I knew I wanted one for home, but I wanted the wireless Bluetooth edition. Only a few months and there will be a wireless one available right? That was 10 months ago! Please Apple, release the mouse from it’s corded captivity! It wants to be free! I love my Mighty Mouse, except I find the side buttons too sensitive for the way I hold my mouse, (I keep clicking them by accident), and the right click annoys me, (as in, when you want to right click you have to take your left click finger all the way off the touch sensitive surface).Now if they could hybrid the (no longer available) < HREF="http://www.the-gadgeteer.com/review/macmice_the_mouse_bt_review" REL="nofollow">MacMice’s The Mouse BT<> with the Apple Mighty Mouse. I would shell out for it. 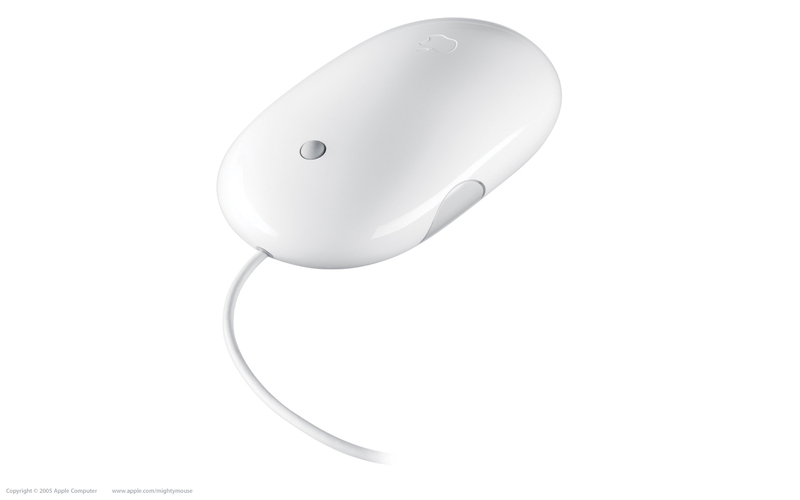 I agree as well – I love the Mighty Mouse (given as a gift) – I love the scroll ball (I’ve finally started to use it to scroll left and right, not just up and down)…but I find the side buttons sensitive and my mousing style forces me to stop and try hard to get a right click out of it. Perhaps it’s my poor form, I really don’t know but it’s aggravating…but I like the mouse overall. Agreed!! That’s the only reason I haven’t bought one yet. Agreed!! It’s the only reason I haven’t bought one for my PB yet. I’ve had mine since it came out and would love a BT version, however I hope that they address some problems;It’s inexcusable for a $60 mouse to have no practical way of cleaning it out. Inevitably, the ball gets gunked up and the only way to clean it is to rub the external side of the ball with a cloth. The right click is getting worse. Whether this is due to a dirty connection or failure of the internal parts is unknown, as there is no way to open the mouse without breaking it. Thanks-could be a good gift for the hubby. I join others here who are happy to see an interesting blog on the Mac. Windows … bad! Mac … good! I’ve never had anything *but* a Mac and never will. Keep up the postings.On another tack … Washington state huh? Lemme guess: Seattle? Can it be use on Windows XP?? Thanks for the feeback about the Microsoft User Data folder. It’s in the Documents folder because that’s where it was “supposed” to go when we shipped Office X. More recently Apple has issued guidelines that only “double clickable, user created documents” should got in the Documents folder. Everything else should go in ~/Library/Application Support/. So you’re right, we should probably move the folder there. The thing about Apple is that they normally do things the way you would expect things to be done, but after being with Windows so long you have to re-learn to trust your instincts and look for the Apple way and believe it is there. When I first switched it was common for me to say “Of course it works this way – it is Apple!”Imagine my surprise last week when I finally decided to upgrade from my Mighty Mouse to Mighty Mouse Wireless. I looked on eBay. No one was selling them. I waited a day. Looked again. No one.I then went to Apple.co.uk and looked there too. Huh?What?How could they NOT? I agree with you – isn’t that the most obvious thing ever? Weirdness! I’ve been a PC user since the mid 90’s and finally got my first Mac two months ago, a G4 Ibook. I LOVE it. I was so overwhelmed with Mac-Lust I stood in line for three hours at the opening of the new store here in NYC. Of course, so did everyone else, so I never got my t-shirt, but anyway…lol…I scored the Mighty Mouse and agree – the little wheel is fabulous, the whole darn thing is great. To answer a question above, yes, I am using the mouse on my PC XP desktop as well as my Ibook when I need mouse action on my laptop.I am planning the purchase of one of those sweeeet IMacs in the (relatively) near future.Great, informative site. Thanks! I love the mighty mouse. It took about two weeks to get used to, but now I can’t go back to traditional two button scroll wheel mice. Too many people write it off because they do not try to use it’s features as designed but rather try to use it like an old style scroll wheel mouse. Previous Post Open XML Spec: 3975 pages!